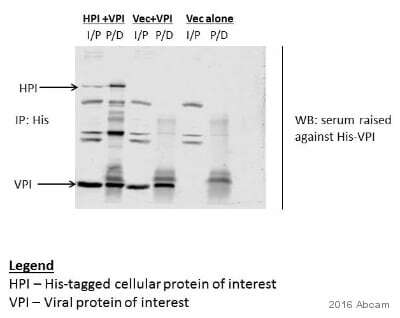 Recognizes His-tagged recombinant proteins or His-tagged proteins overexpressed in cells. Our Abpromise guarantee covers the use of ab18184 in the following tested applications. Immunoprecipitation of His/FLAG tagged PDCD5 using ab18184 at 1/100 dilution. 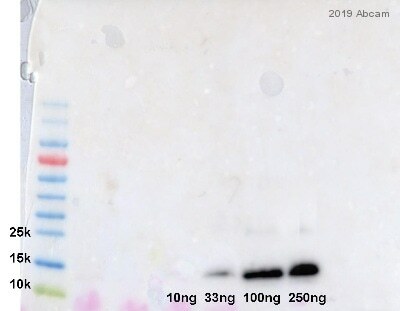 Lanes 2-5 : Immunoprecipitation of His/FLAG tagged PDCD5 using ab18184 from mixture of ~50 ng purified His/FLAG tagged PDCD5 and 15 µL RRL in 300 µL buffer. 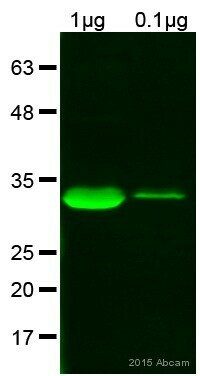 Lanes 6-7 : Purified PDCD5 from E. coli with ~60-70 ng protein. The lowest band in each lane is ~ 20 kDa and is PDCD5. The upper bands in lanes 2-5 are the heavy chain (~50 kDa, runs as doublet) and light chain (~25 or 26 kDa). 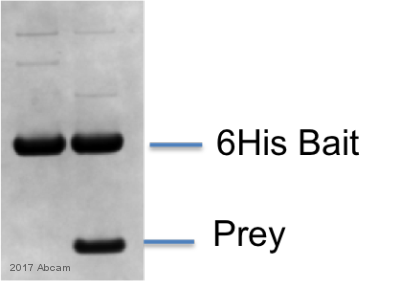 Western Blot was performed with a mouse anti-FLAG primary antibody at 1/2000 dilution. 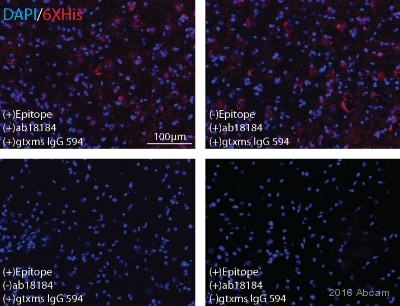 An IRDye®800CW-conjugated goat anti-mouse IgG was used as a secondary antibody. 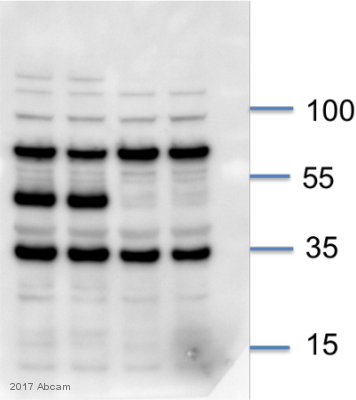 LEFT: untransfected control; RIGHT: anti-His (in red) on His-tagged fusion proteins in HEK293 cells. Both counterstained with DAPI (in blue). Immunocytochemistry/ Immunofluorescence - Anti-6X His tag® antibody [HIS.H8] (ab18184)This image is courtesy of an anonymous abreview. ab18184 at a 1/1000 dilution staining 6X His tag in transfected human HEK293 cells by Immunocytochemistry/ Immunofluorescence incubated for 12 hours at 22°C. PFA fixed. Permeabilized using 0.1% Triton X-100 in PBS. Blocked using 3% BSA for 1 hour at 22°C. Secondary used at a 1/1000 dilution polyclonal Goat anti-mouse IgG (H+L) conjugated to Alexa Fluor 488 (green). DAPI staining (blue). Blocked with 5% milk for 30 minutes at 25°C. Incubated with the primary antibody for 16 hours at 4°C in 1X PBS/Tween, 5% milk.